H. P. Lovecraft (1890-1937) was the premier horror writer of his time, and continues to exert an influence on practitioners of that dark art. Most of his work is unified by a common theme--the Cthulhu (kuh-tool-ew) Mythos--in which gods furtively control the fate of mortals, and a mere glimpse of the universe, by nature hostile, is enough to drive a man insane. A number of Lovecraft's peers borrowed the Mythos for use in their own stories, launching a tradition that continues in our day. This generous volume, commemorating the 50th anniversary of the founding of Arkham House (established to preserve Lovecraft's work in hardcover), features 22 Mythos stories by Lovecraft and 15 other writers, including the poetic Clark Ashton Smith, the action-oriented Robert E. Howard (creator of Conan the Barbarian), Arkham's co-founder August Derleth and the youngest of the original circle, Robert Bloch ( Psycho ). 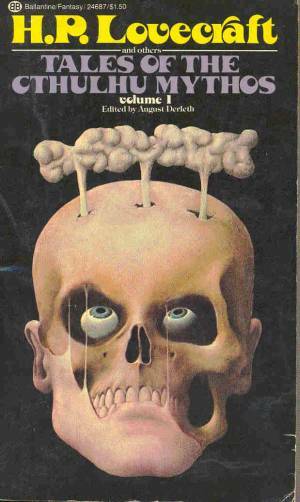 Modern writers include Colin Wison, Joanna Russ, Richard Lupoff, Karl Edward Wagner; and Ramsey Campbell, Fritz Leiber and Stephen King, who contribute especially fine work (noticeably absent is T.E.D. Klein). James Turner, who edited the volume, supplies a fine introduction.